Volume 4 of Finn and Charlie Are Hitched, Everyone is Someone’s Fetish, debuted at CAKE in May 2014. 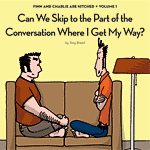 The book with contains comics run online in 2012 and 2013, and includes such story lines as Corey’s Makeover, Gus Gets Married, Ken & Corey Talk Monogamy, and Gus Asks a Very Big Favor. If you request a signed or inscribed version (for $2 more), I also put a little doodle in there. Awesome! A big many enjoying a tiny drink. 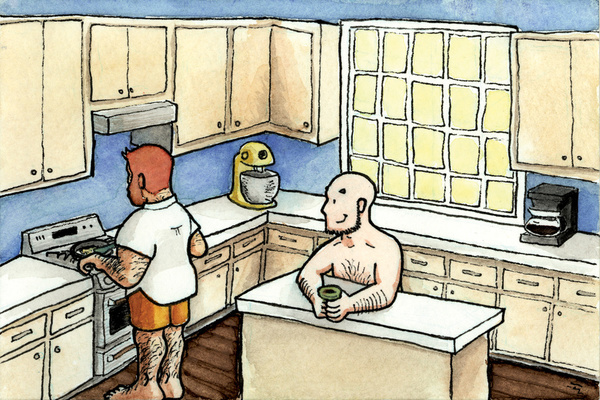 A domestic scene… a gay couple making breakfast together. 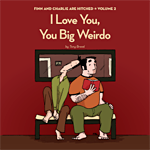 Volume 3 of Finn and Charlie Are Hitched, How Would I Know If You’re Dreaming?, debuted at CAKE in June 2012. 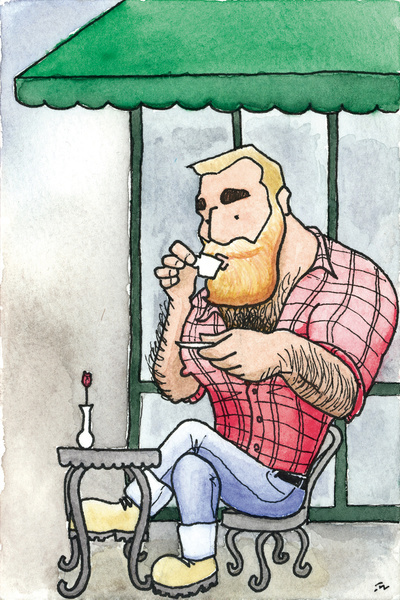 The book with contains comics run online in 2010 and 2011, and includes such story lines as Charlie’s Indie Rock Beard, Finn’s Dream, Candy’s Long-Lost Daughter, and When Finn Met Charlie. Book, too! It compiles the second two calendar years of Finn and Charlie are Hitched (1/08/08-12/29-09). If you request a signed or inscribed version (for $2 more), I also put a little doodle in there. Awesome! Book! It compiles the first two calendar years of Finn and Charlie are Hitched (4/23/06-1/1-08). If you request a signed or inscribed version (for $2 more), I also put a little doodle in there. Yes!